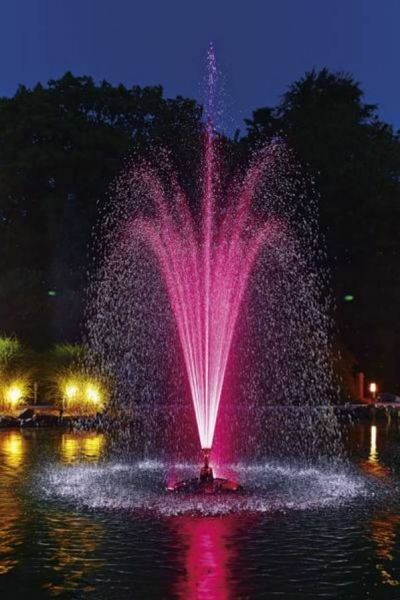 The brand new ProfiLux RGB LED Colour Changing Light Set has been specifically designed for use with the OASE PondJet Eco Floating Fountain. 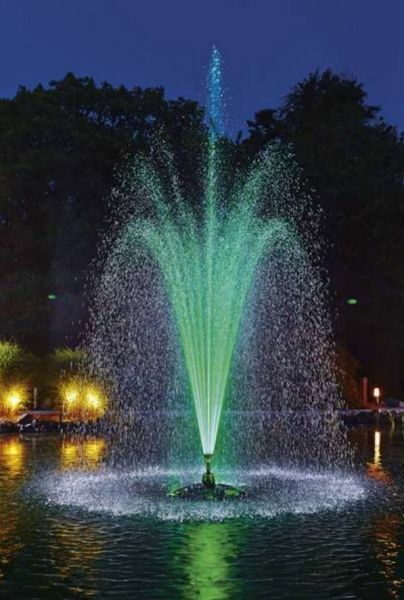 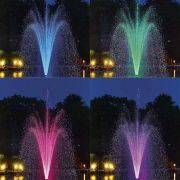 Water Garden Ltd have packaged the RGB Light Set to include the OASE FM Master WLAN Smart Controller and EGC Connection Cables to enable control of both the fountain and the lighting colours, all via your Smart Phone or Tablet. The RGB spotlights and submersed driver can be connected to the supplied FM Master WLAN's DMX-RDM Port with the supplied 20 metre EGC Connection cable, and the 20 metre mains cable is then wired into one of the 3 on/off ports. The Lighting can then be controlled via the free OASE App, allowing you adjust the colours, fix the colour or allow these colours to cycle through. 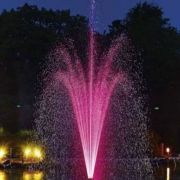 Both the RGB Lights and the PondJet can also be set on individual 24 hour timers, again via the App. The supplied FM Master WLAN Controller can be mounted on dry land, with the PondJet floating fountain and RGB Light Set connected. The WLAN controller will allow on/off control of the fountain pump but will also control the fountain display height via the free Oase App and your smart phone/tablet (iOS 7.x or higher and Android 4.0.3 or higher). 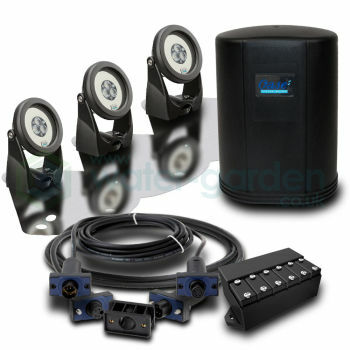 Two spare on/off ports remain on the WLAN controller for supplimental garden lighting or other electrical devices. All brackets and fittings for connection to the Pond Jet Eco Floating Fountain. 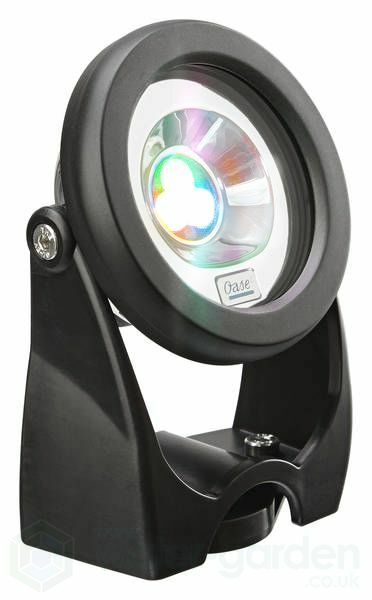 OASE ProfiLux Garden LED RGB Lights - Key Product Features. 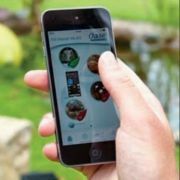 Full Control via OASE App. The ProfiLux LED RGB produce bright LED lighting in a wide range of fixed colours and colour changing sequences. 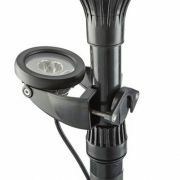 These LED lights can be used to spot light individual features, or be grouped in synchronisation to illuminate larger areas and features. 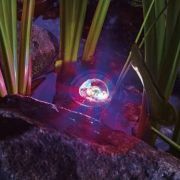 The ProfiLux LED RGB is suitable for installation underwater down to 4 metres water depth, including the 24 volt transformer! These RGB LED lights can also be installed on dry land and come supplied with a mounting spike for staking in soft ground. With the InScenio OASE FM-Master EGC, colour selection and control of the lighting is done with the use of a smart phone or tablet. 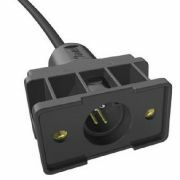 This simplifies control for the user and eliminates the need for remote controls and complex programming systems. 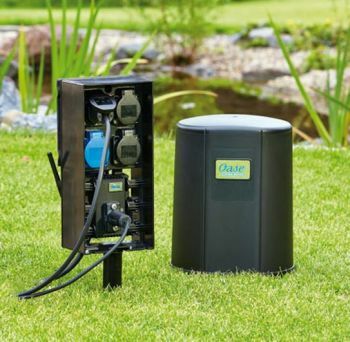 The FM Master WLAN Easy Garden Control allows numerous additional devices such as pumps, fountains and additional lighting systems to be switched, timed and controlled from the same smart device, all on the same easy to use OASE App. The ProfiLux Garden LED RGB lights can be installed in a free-standing position under the water or on dry land, staked into soft ground with the supplied spike, or mounted onto Aquarius Fountain Set OASE fountain nozzle risers with the special mounting plate and bracket. This innovative OASE LED RGB system has also been produced as a packaged set for the OASE Pond Jet ECO Floating Fountain. The Pond Jet Light Set contains 3 x ProfiLux RGB lights, transformer, FM-Master WLAN EGC, 20 metre EGC Cable and Brackets. The ProfiLux Garden LED RGB lights are supplied with 5 metres of power cable for connection to the 24 volt underwater transformer. 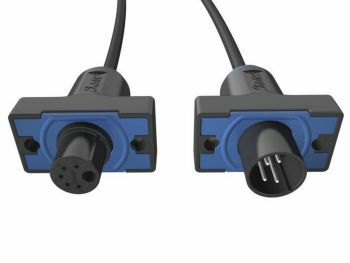 These cables can be extended up to 12.5 metres long per spotlight if required, with the use of additional 7.5m long special ProfiLux Extension Cables . OASE Easy Garden Control is a new operating system for pond and garden, that originates from the commercial OASE Fountain Technology ranges. 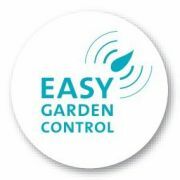 DMX-RDM has now been simplified and introduced into the garden, opening up this exiting new power control system to everyone!